Simpson’s death on the barren, sun-blasted slopes of Mont Ventoux in 1967 often disproportionately overshadows the rest of a remarkable career. World Champion at the age of 27, Tom Simpson was Britain’s first cycling superstar and his premature death perhaps stunted the development of more than his own already illustrious career. With their talismanic leader gone, British cyclists would not again unearth a realistic challenger for the overall win at the Tour or who would wear the rainbow jersey for almost half a century. Simpson is often portrayed as everything that is idealised about successful British road cyclists: the humble roots, the strength of will to move abroad and thrive, and an innate charm both on and off the bike. But ever-present in the Tom Simpson story are also the bad sides of the era in which he lived, including the incessant need to chase results for money and the use of amphetamines. 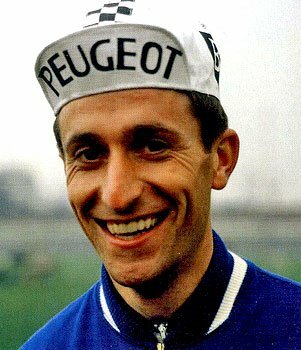 For now though, today of all days, we should focus on his remarkable achievements; foremost of which are his Milan-SanRemo win and, of course, his World Championship victory. This entry was posted in Birthdays, Le Tour de France, Pro cycling and tagged Cycling, happy birthday, milan sanremo, Pro cycling, rainbow jersey, tom simpson, ventoux. Bookmark the permalink.